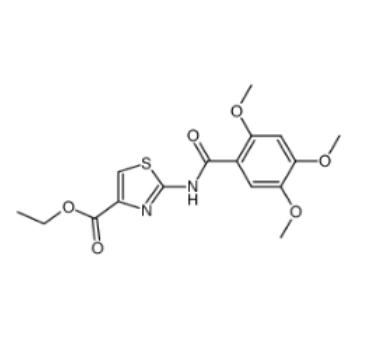 Acotiamide hydrochloride intermediate 2- (2,4,5-trimethoxybenzamido) thiazole-4-carboxylate CAS number 185105-98-0, which is the N-1 Step of intermediate of acotiamide hydrochloride. His traditional preparation methods is using 2,4,5-trimethoxy benzoic acid as the starting material, and take thionyl chloride reaction to produce 2,4,5-trimethoxybenzoyl chloride, and then condense with 2-aminothiazole -4-carboxylic acid ethyl ester to give the target compound ethyl 2- (2,4,5-trimethoxybenzamido) thiazole-4-carboxylate. The first condensation reaction in the above method needs to use a large amount of thionyl chloride. As we all know, thionyl chloride is a strong corrosive solvent that greatly damages equipment. Sulfur dioxide produced by thionyl chloride and hydrogen chloride can cause environmental pollution. In addition, the preparation of acid chloride is greatly affected by the humidity of the environment, and the operation requirement is relatively high. More importantly, the above-mentioned method is complicated after processing, it is difficult to enlarge the production, the overall yield is low and the cost is high. Some people improved the preparation method of Acotiamide hydrochloride intermediates ethyl 2- (2,4,5-trimethoxybenzamido) thiazole-4-carboxylate CAS number 185105-98-0 , the method is as following: under the presence of N,N'-Diisopropylcarbodiimide and 1-Hydroxybenzotriazole hydrate and acid-binding agent, 2,4,5-trimethoxybenzoic acid and 2-aminothiazole-4-carboxylic acid ethyl ester react in an organic solvent to obtain the target compound Acotiamide hydrochloride intermediate ethyl 2-(2,4,5-trimethoxybenzamido)thiazole-4-carboxylate, this method not only avoids the use of thionyl chloride,but also improve the operating environment, and the reaction time is short, fewer side effects, Can get high purity intermediates through a simple filter washing ,the reason is that during the condensation reaction was cooled to below 10℃,then the system was added dropwise N,N'-Diisopropylcarbodiimide, Firstly, 2,4,5-trimethoxybenzoic acid reacted with N,N'-Diisopropylcarbodiimide gives a transition state intermediate which is condensed with ethyl 2-aminothiazole-4-carboxylate in the system to give the desired target compound. The dropwise addition of N,N'-Diisopropylcarbodiimide below 10℃can promote the condensation reaction between the intermediate of the above transition state and ethyl 2-aminothiazole-4-carboxylate and reduce the intermediate of the transition state itself and the possibility of rearrangement to generate by-products, which can greatly reduce the side reaction, which is also conducive to improving the reaction yield and product purity, calculated, according to the method of synthesis yield up to 68%, a purity of 99% the above. In addition, the fastest time to complete the reaction was 2.5 hours, much less than the 20 hours required by the prior technology. Looking for ideal Acotiamide Related Compound 185105-98-0 Manufacturer & supplier ? We have a wide selection at great prices to help you get creative. 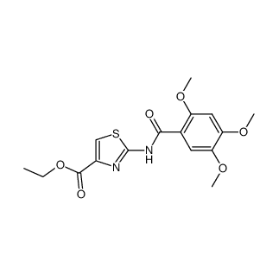 All the Acotiamide Intermediate 1 CAS 185105-98-0 are quality guaranteed. We are China Origin Factory of CAS 185105-98-0. If you have any question, please feel free to contact us.